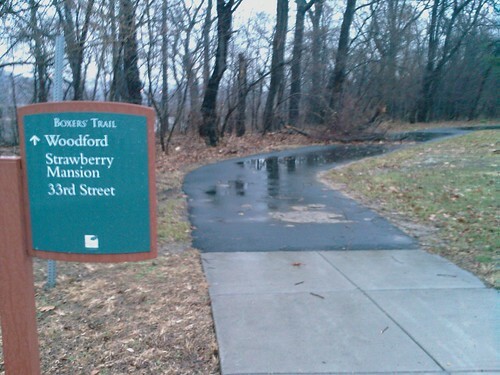 The Boxers Trail is a newly improved network of paths in East Fairmount Park beginning at Strawberry Mansion and winding past Woodford, Laurel Hill the trail then becomes gravel and follows a cascading stream before following the contours of the East Fairmount Park escarpment down to Fountain Green Drive where a new traffic signal on Kelly Drive enables a connection to the Schuylkill River Trail. The trail becomes a paved sidepath over to the Smith Playhouse and ending at the Disc Golf Course near 33rd St.
"Fountain Green Drive where a new traffic signal on Kelly Drive..."
This traffic signal is constantly on blinking yellow -- it's just as dangerous to cross Kelley Drive as it was when there was only a stop sign there! We have been told by the Streets Department that the signal will be activated in a couple of weeks. It's on blinking yellow now so drivers can get acclimated to the presence of a traffic signal there. Am i correct in assuming that the "brown" segments on the embedded gmaps denotes unpaved sections, whereas "blue" segments represent paved sections? Is this a reflection of its current status or once construction is complete? Does anyone know how long this trail is? Why the name fountain green Drive?